Hi there! 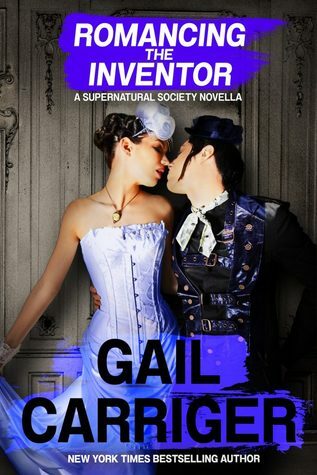 Today I’m sharing a review for a new steampunk-style lesbian romance from Gail Carriager. ROMANCING THE INVENTOR features the lovestory of a woman I’d read about in her Finishing School books: Genevieve LeFoux. Genevieve’s all grown up, and the object of a parlourmaid’s curious eye. Supernatural Society novellas can be read in any order. This is a book set in the 1870s London in a fictional past that includes vampires and werewolves. Much of this world has been described in previous middle-grade/YA book series (Parasol Protectorate or Finishing School) though this is an adult book featuring adult characters–who’d been youths/younger in the previous books. I kinda think you’d enjoy this book better if you’ve read some of those, because the world is already built, and the paranormal elements not as thoroughly explained in this book, as a result. Imogene Hale is a 28 year old beautiful woman in a village. She’s had many a suitor, but never accepted any man…because she’s attracted to women. When a vampire hive takes up residence at Woolsey Castle, Imogene seeks a job. She’s heard vampires are perverted, and she may be able to find satisfaction with the Countess, if she’s very lucky and doesn’t get drained first. Unfortunately, the vampires are selective. They sense she’s an innocent, and want to “save” her for a special occasion. In the meantime, Imogene is a parlourmaid and begins to attend the needs of the Inventor, Madame LeFoux–otherwise known as Vieve, or Genevieve, from earlier books. Genevieve is a cross-dressing “tom,” a woman who likes women…and she very much likes Imogene. But Genevieve is still grieving her wife, and that’s damping Imogene’s prospects with the inventor. There’s a lot of posturing, and scheming on the part of the vampire countess and the werewolves, who are close friends with Genevieve. It looks as if Imogene will become just another snack for the hive, but Genevieve is able to halt this pettiness, and make some small claim to regaining her heart and finding love. This is a sweet, slow-burning romance. Imogene makes a good partner to Genevieve, having an affinity for mathematics that complements Genevieve’s ingenuity. There are many obstacles to overcome, but Imogene is a steadfast companion, and finally wins Genevieve to her side. There’s not a lot of steam, but the language is fun, and the situations engaging. The real focus here is on Imogene, and how this country lass makes a good life with Genevieve. There are many characters here that are part of the larger fictional world, and fans will be excited to see Genevieve get her happy ever after. Interested? You can find ROMANCING THE INVENTOR on Goodreads and Amazon. Gail Carriger writes comedic steampunk mixed with urbane fantasy. Her books include the Parasol Protectorate and Custard Protocol series for adults, and the Finishing School series for young adults. She is published in 18 different languages and has 13 NYT bestsellers via 7 different lists (including #1 in Manga). She was once an archaeologist and is overly fond of shoes, octopuses, and tea. You can find Gail online on her website, Facebook and twitter. Gail has a fun newsletter: the Monthly Chirrup, sign up here.